Philip II of Macedonia, the father of Alexander the Great, invaded Greece in the 4th century BC and subjugated most of the Greek city states, Athens included. Filipo II de Macedonia, el padre de Alejandro Magno, invadió Grecia en el siglo IV a.C. y subyugó la mayoría de las ciudades-estado griegas, incluso Atenas. Neither Philip II, nor even his son Alexander the Great invaded Sparta. Ni Filipo II, ni siquiera su hijo, Alejandro Magno invadió Esparta. I don’t know about you but it is one of my most favourite quotes – it’s so wonderfully… well, laconic, right? No sé de ti, pero esta es una de las citas que me gustan sobre todo – es so maravillosamente… pues, lacónica, ¿no? Homer, for example, makes men better than they are; Cleophon as they are; Hegemon the Thasian, the inventor of parodies, and Nicochares, the author of the Deiliad, worse than they are. As, in the serious style, Homer is pre-eminent among poets, for he alone combined dramatic form with excellence of imitation so he too first laid down the main lines of comedy, by dramatizing the ludicrous instead of writing personal satire. His Margites bears the same relation to comedy that the Iliad and Odyssey do to tragedy. So in this respect, too, compared with all other poets Homer may seem, as we have already said, divinely inspired, in that even with the Trojan war, which has a beginning and an end, he did not endeavour to dramatise it as a whole, since it would have been either too long to be taken in all at once or, if he had moderated the length, he would have complicated it by the variety of incident. As it is, he takes one part of the story only and uses many incidents from other parts, such as the Catalogue of Ships and other incidents with which he diversifies his poetry. In composing the Odyssey he did not include all the adventures of Odysseus- such as his wound on Parnassus, or his feigned madness at the mustering of the host- incidents between which there was no necessary or probable connection: but he made theOdyssey, and likewise the Iliad, to centre round an action that in our sense of the word is one. Cuando alguien proponía para la libertad de los griegos acciones no faltas de nobleza, pero difíciles de realizar, [Agis, hijo de Arquidamo] le decía: «Tus palabras, amigo, necesitan un aval de poder y dinero». (Plutarco: Obras morales y de costumbres, III. When an Argive said once upon a time, “There are many tombs of Spartans in our country,” a Spartan said, “But there is not a single tomb of an Argive in our country,” indicating by this that the Spartans had often set foot in Argos, but the Argives had never set foot in Sparta. Cuando un argivo dijo en una occasión: «En nuestra tierra hay muchas tumbas de espartanos», un espartano le respondió: «Pues en la nuestra no hay ni una sola de argivos», porque ellos habían invadido muchas veces Argos, pero los argivos jamás Esparta. It was evening when we made our way back to the cove. The sun was setting fire to the headlands west of us, and the sea had become absolutely still. Not even a cat’s-paw trailed across the purple water. The sea was truly like wine to look at. The professors who had decried Homer’s adjective and invented other meanings for it, had never been sailors. The ultimate laconic reply of defiance: that of Leonidas to Xerxes at Thermopylae, unbeatable in its simplicity. Especially in Greek where it’s only two words: molon labe. When Xerxes wrote again: ‘Deliver up your arms,’ he wrote back: ‘Come and take them’. Lo último en el desafío lacónico: lo de Leónidas a Jerjes en las Termópilas, con su sencillez imbatible. Especialmente en griego, como que solo consiste de dos palabras: molon labe. While Byron chose to tell the story of the Battle of Salamis short and sweet in The Isles of Greece – which, by the way, is part of a much longer poem, Don Juan -, the Athenian playwright Aeschylus wrote an entire play based upon it. and the tombs of your ancestors: now the struggle is for all things. Can you imagine telling a story, with your audience hanging upon your every word, breathless with excitement or moved to tears – although they had heard the story many times before and know the final outcome? Because that’s exactly what Ancient Greek playwrights had to do; and Aeschylus pulled it off beautifully with The Persians. But it’s nice to break the daily routine once in a while. Instead of going home after work, I head for Bloomsbury. The lights are dimmed. The crowds are gone; it’s quiet. I relax in the members’ room with my book and a glass of wine before going for a wander. I can get up close to the most popular exhibits without an elbow fight. I can contemplate. I can read the labels in peace. Dark earth’s far-seen star – the island as seen from above by the gods, glowing with light in the dark sea – is one of those memorable phrases that turned the famous Roman poet Horace into one of Pindar’s life-long fans. Sadly, not much else of this Procession Song survives today (you’ve just read half of what there’s left). Delphi is just a small town built into the hillside under Mount Parnassus – home to the Muses – and overlooking the Gulf of Corinth. 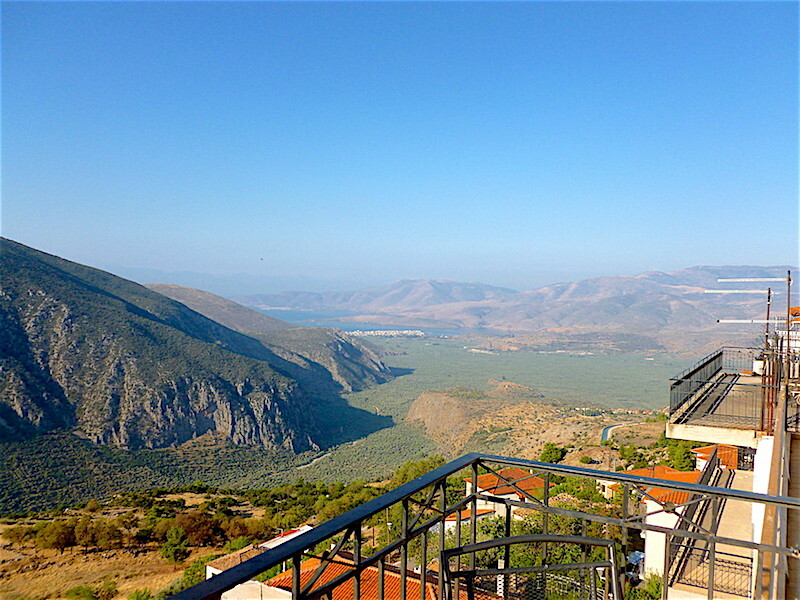 It’s three hours drive from Athens and even at the height of the tourist season you can escape the crowds here.